The way that healthcare systems operate is going to change forever. In most cases, primary care is currently delivered by general practitioners (primary care physicians) or community care nurses. In some cases, certain individuals will even attend the emergency department in tertiary hospitals to obtain primary care, without referral. This model of care is inherently reactive in nature and therefore suboptimal in its utilization of valuable healthcare resources; the individual interprets their symptoms and then seeks primary care when they deem appropriate. Even if visits to tertiary care centers are by referral from primary care physicians, often hospital admission may be unavoidable as the patient may not recognize the severity of their condition at an early enough stage to avoid hospitalization. One acute example of this scenario relates to falls among elderly individuals. Falls and fall-induced injuries among the elderly population are a major cause of morbidity, disability and increased health care utilization. It is estimated that approximately one in three persons over the age of 65 years old fall one or more times each year; this ratio rises to about 50% for persons over the age of 80 years old. In Australia alone, in 2003- 2004, the cost of fall-related hospitalization is estimated to have exceeded U.S. $500 million. Through early intervention using physical rehabilitation strategies which are tailored to address the functional deficits of the individual, future falls may be prevented; however, those individuals at risk of falling must first be identified. Falls-risk assessment is currently a very active research area spurred on by our aging populations in developed nations. Many clinical falls-risk indices have been developed based on questionnaires regarding previous falls, observations of gait, and balance and postural change maneuvers. Often, these methods require specialized equipment and the presence of a trained assessor which limits their capacity to monitor and screen the general population. In recent years, through the miniaturization of sensor technologies and the maturation of wireless communication protocols, it has become feasible to address the shortcomings in traditional clinical falls-risk assessments, and bring reliable continuous assessment of falls-risk to the home. Specifically, microelectromechanical sensors (MEMS), which can measure acceleration, rate of rotation and barometric air pressure, are used. All sensors and a wireless transceiver are housed in a single device and worn on the hip, which enables the reliable characterization of human movement. Our group at the University of New South Wales has developed a directed routine which includes a short battery of commonly used physical assessment tasks. 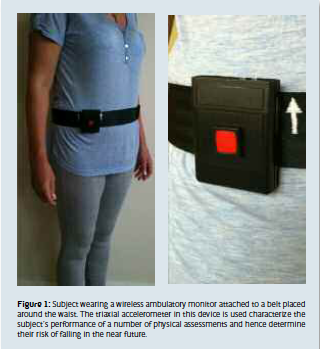 These tasks are performed unsupervised in the home and can be characterized using a single triaxial accelerometer device (designed at our laboratories), clipped onto a belt around the subject’s waist (see Fig. 1). Explicitly, the direct routine consists of three physical assessments – rise from a chair, walk three meters and return to the chair; place the left foot on a small step, then back to the floor, then the same with the right foot, and repeat four times; and stand up and sit down five times. The resulting accelerometry signals are analyzed to extract information relating to speed, strength and balance, and are employed in a model which estimates the subject’s risk of falling. Results from testing on 68 elderly subjects show that the falls-risk estimates generated by the model correlate extremely well (99%) with a commonly used clinical falls-risk assessment test – the Physiological Profile Assessment. To provide some background in regards to how such monitoring technologies might find their way into the home environment, we need to examine the current state of fall detection devices. Fall detection technologies, which are different in that they identify the occurrence of a fall after the event, are beginning to mature, although high false positive alarm rates still pose a challenge which needs to be overcome. The marketplace for such technologies is competitive and already crowded, with monitoring devices available from: Tunstall (Tunstall Group, UK); iFall (Android mobile phone ‘App’); Verhaert Zenio (Verhaert¸ Kruibeke, Belgium); Wellcore Personal Emergency Response System (Wellcore, San Jose, CA, USA); myHalo Fall Detection Device (myHalo, Novi, MI, USA); and, Philips Lifeline with AutoAlert (Philips, Amsterdam, the Netherlands). It is becoming apparent that fall detection devices, in whatever final form they assume, will become an established technology for monitoring the elderly at home. Therefore, it can be envisaged that future fall detection technologies in the home will eventually include some type of falls prevention strategy, similar to the method described earlier. The key factor in the success of all of these technologies is the Internet. The ability to unobtrusively retrieve patient health information from their home, act on this information, and issue health management recommendations from a distance will open up a world of possibilities for healthcare. While the transition will be painful, change is coming. 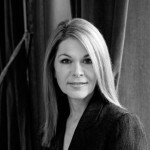 As the Australian government currently ponders the pros and cons of spending up to U.S. $43 billion on a proposed initiative to install fiber optic cable, carrying broadband speeds of approximately 100 Mbits/s, to every home in the country, the migration of primary healthcare to the home is proving to be one of the critical issues driving the debate. Irrespective of the successes of Australia’s National Broadband Network, the Internet will continue to permeate into our everyday lives, and it is only a matter of time before healthcare systems change the way they do business and begin to make full use of this incredible communication resource at their disposal. We plan to trial our falls-risk assessment technology on a larger scale, and in a completely unsupervised setting, over the next year. We are currently redesigning the unit so it will not only record acceleration, but will contain gyroscopes (to measure angular velocity) and a barometric air pressure sensor (to detect changes in the device altitude), improving how well human movement may be characterized. A speaker will also be added so that a voice recording may guide the user through the directed routine assessment, since they will be otherwise unsupervised. It is our hope that in the coming years, this form of monitoring technology will significantly improve the quality of life of an aging population by reducing their incidence of falls.